Many of us who have rats or mice as pets are big collectors and are always looking for beautiful new figurines to add to our extensive collections. Some may even be new rat or mouse owners looking for that special line of products to collect. When my husband and I were out exploring one day near our new home in Massachusetts, I saw a cute little shop in Concord with a red and white striped awning which read "The Concord MouseTrap". I’ve seen store names before that contained the word ‘mouse’ which didn’t have anything to do with mice, so, although I was excited and insisted on going there first, I was still skeptical about it being anything truly interesting. Was I wrong! Upon entering the store, I immediately recognized the figurines, but nowhere had I ever seen so many different ones. The shop is a dealer of "Wee Forest Folk®" (pictured on the borders of this page), but also carries a few other lines, such as Hagen-Renaker, Harmony Kingdom boxes from England, and J.W. Stannard wind chimes. While talking with the owner of the shop, Bill Montague, I was told that Wee Forest Folk® are made and hand-painted right here in Concord, Massachusetts, by the Petersen family (Annette, Donna, and William). I guess that explains why he would have so many more than I have ever seen. Wee Forest Folk® are currently in their 25th year of production, having started making them in 1972. Bill has been a dealer since 1976, beginning with his previous shop called "Montague’s" and continuing with "The Concord MouseTrap" which opened its doors in 1993. Even though I was aware of Wee Forest Folk®, I never realized how much of a collector’s item they were. Many, many people who don’t even own rats or mice collect them and are extremely serious about it. Some people even must have each different variety of one piece. Now that’s a collector! I guess it’s kind of like some rat or mouse breeders who have to have every new color, marking, or variety developed. The Concord MouseTrap is also online. The extensive web site boasts a terrific online newsletter called The Monthly Squeak - Wee Forest Folk News. Contained in the pages and pages of information is news of out-of-state collectors visits to the shop, information about different releases of the same piece and where to find them, a complete catalog of Wee Forest Folk® pieces with photographs and prices, and even available secondary market pieces. There are even collectors’ club listings. Imagine that, clubs for people who collect mouse figurines! Well, why not, we have clubs for people who have the real thing, don’t we? The Concord MouseTrap also carries the new line by William Petersen - Wee Sea FolkTM. These pieces look like they have been carved from bone, but are really made from hydro-stone, a plaster of paris of sorts. I couldn’t have been any more impressed than I was with these pieces. They are an absolute must for me to add to my own collection as soon as finances allow. William Petersen, the sculptor and craftsman, says this set was two years in development, which shows in the quality of each piece. The fishing industry was so much a part of New England life and these 13 figurines detail that beautifully. As of 1997, there are a total of 419 Wee Forest Folk® figurines. If you can’t afford to collect all 419 of these spectacular tiny figurines, you may want to concentrate on bringing more of your hobbies together by getting a figurine with a mouse or mice doing something else you love to do. This should not be difficult to do since these figurines portray mice doing just about anything possible! You can get a mouse sewing, a mom mouse giving her baby a bath, a mouse on a tractor, mice baking, a mouse tooth fairy, a skier, making a snowman, playing baseball, camping, surfing, playing in a sandbox, flying a kite, saying nighttime prayers, gardening, hugging, picnicking, and even mice on a first date! There are also mouse figurines for just about any holiday. You can get the manger with all the wise men, angels, and shepherds (called the Christmas pageant), the complete set from A Christmas Carol, the nutcracker, a young mouse on Santa Mouse’s lap, mice by the Christmas tree, and many other Christmas figurines. There are also figurines for Easter, Valentine’s day, Halloween, birthdays, graduation, and even a wedding couple. Everyone can find something they just must have from this line! If you haven’t already started collecting Wee Forest Folk® or Wee Sea FolkTM, don’t waste any more time - go check out the online catalog at http://www.concordmousetrap.com or contact Bill for a printed catalog at the Concord MouseTrap, 10 Walden Street, Concord, MA 01742, (978) 287-4800, FAX (978) 287-4240, Email montague@tiac.net. While I was in the shop I also noticed a shelf with several copies of a book called Little Mouse, and a photograph of a wild mouse posed exactly as in the drawing on the cover of the book. (The book was published in 1993, but the real mouse only showed up and posed for the photo in the alley outside the shop in the fall of 1997!) The book was written by Bill, the owner of the store, who is also an author and has a love for the history of the town of Concord. 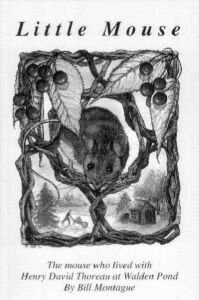 The book is about a mouse who visited American Essayist Henry David Thoreau during his two year period (from 1845 to 1847) living in a one room cabin at Walden Pond in Concord, Massachusetts. 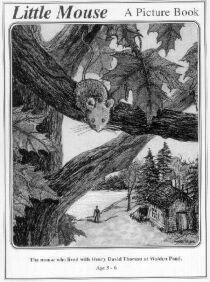 What makes this book really cute and fun is that it is written in fairytale form from the mouse’s point of view, but also includes much factual information about Thoreau’s life and many of his complex statements which are then translated into mouse talk to make it easier for children to understand. It is the hope of the author that Little Mouse will inspire children and adults alike to read Walden, one of the great masterpieces of American literature written by Thoreau. The 56 page book is full of easy, fun reading and is illustrated with many adorable black and white drawings by Concord artist Maxine Paine. It is currently in its second edition, having sold 5,000 first edition copies. You can order the book directly from The Concord MouseTrap for $9.95 including shipping. One dollar from every book sold goes to the Walden Woods Project, dedicated to buying and preserving land around Walden Pond to keep it from being developed. In addition to Little Mouse the book, Little Mouse A Picture Book is also available. This 8-1/2 by 11 inch, 28 page book can also be used as a coloring book. The price is $4.95 plus shipping. 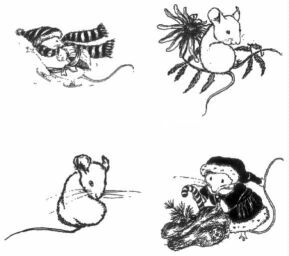 Four cute drawings from the book are also available on 2” x 2” gift enclosure cards as well as a 3-1/4” x 4” color card (blank inside) of the cover drawing of Little Mouse A Picture Book.. All are very inexpensive!